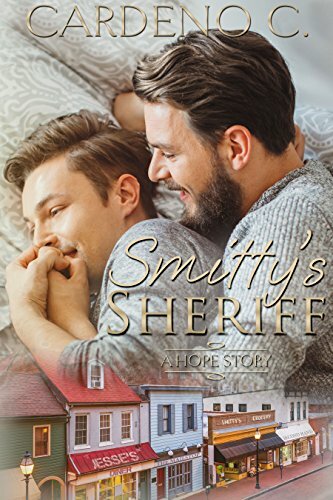 Bethany reviews ‘Smitty’s Sheriff’ by Cardeno C. Published by The Romance Authors on July 17th, 2017, 117 pgs. Why I read this book: This was in our emails for review, and I am a HUGE Cardeno fan. This review originally should have been posted sometime last week as a part of Different Publishers week, but since today is release day I decided to hold off by a day. There is no denying how much I love this authors work, and this one was no different. This one is on the shorter side so I am afraid this review will be on the short side, only because I hate to give anything away. What I really liked about this one is you basically start in the middle of Richard and Todd’s relationship, or I guess I should say lack of relationship. You see Richard is quite a bit older than Todd and when they were together before, RIchard never thought Todd was capable of being in a committed relationship. Just a little over 20 when they first got together Richard figured it was just a phase for Todd, that he would soon be board of someone so much older and more wanting to sow his wild oats. So he does what he thinks is the best for both of them in the long run, and he ends it. But you see Todd doesn’t understand why, he thought things were good between them. So he assumes it mush be him, that he isn’t smart enough, or good enough for someone like Richard. Oh he still loves him, and would do anything to be with him again, and he did a lot to win him back after Richard called things off. So when Todd’s sister, and Richard’s best friend, has to leave for a few months she leaves her daughter with both of them. Forcing them to basically co-parent. I really loved watching these two rediscover why they worked so well when they were a couple and also figuring out what came between them in the first place. I loved these two so much, Richard likes being in control and Todd thrives on that. Even though this book is on the shorter side and I finished in one sitting, it is one of those that I know I will be re-reading many times, like when I need a hug. Just like most all of Cardeno’s books this is one I definitely recommend if you want something sweet, hot in that alpha male “just do what I say cause I know what is best for you” way. You won’t regret it.